Three brothers by the name of Ruven, Ilan and Shmuel Flaishler make up one of the hottest dance acts / DJ teams around the world these days. They are better known as the 'Flash Brothers', who are the hottest dance music export from Israel to date as well as frontrunners on the international dance scene. The Flash Brothers are true pioneers in the Israeli dance music scene with regards to progressive house, Progressive trance and electro 80's house music. They don't like to be put into one distinct category, rather they consider themselves to be underground dance music producers / performers. Their ambition, hard work, and massive chart success - e.g. 2004 summer anthem 'Amen' - have paid off, as this hotly tipped trio performs all over the world nowadays at some of the most prestigious clubs and biggest events. The best is yet to come for the Flash Brothers! The Flash Brothers are currently based in Tel Aviv, but the boys enjoyed their upbringing in the isolated town of Nazareth in Israel. While growing up and attending school in their hometown, the boys used to listen to the most upfront music in all genres; especially electronic music fascinated them. Their interest for quality music stems from an early age, when their father used to listen with them to late 70's and early 80's disco music. Listening to quality music was a prominent element in their daily routine. As time moved on, the musical preference of the brothers evolved from disco to new wave electro pop, and then into house, acid, and so on. Having gone through all these different soundtracks over the years, probably adds to their great versatility as producers / DJs. They're part of an extraordinary family, as normally brothers tend to clash from time to time. There's no room for sibling rivalry in this trio though, as they all share the same passion for producing quality music. This passion keeps them focused and results in some of the finest dance productions money can buy. Their venture into the world of dance music production took great strides when Ruven studied sound engineering & production at the leading school of music in Tel Aviv, while Shmuel focused on computers and Ilan was strongly into clubs, labels and DJing. It was only a matter of time before they set up their own professional studio in Nazareth and afterwards in Tel Aviv. Their big break came in 1997 when they met DJ Choopie, who signed them to his label Agnosia Records right after the first demo he received from the trio, which really impressed him a lot. In hindsight, one can only say that DJ Choopie has a fine eye for spotting talent, as the Flash Brothers turned out to be a huge success on the production front. The first worldwide success came back in 1998, when one of Flash's earlier productions 'Amazonas' (a hybrid of Israeli-Dutch-European styles) was released and signed worldwide to Germany's renowned dance label Dos or Die (Zomba). The single was picked up and hammered by renowned DJs like Tiësto, Scott Bond, John Kelly, Brandon Block, and Graham Gold, to name but a few. Another release followed shortly after. Under the TBN moniker, the boys released the smashing 4-track 'Entrance to Nazareth EP', which was released by the Dutch EDM label and had a progressive trance soundtrack. Early 2000, as a follow up to the success of many of their productions, the brothers released their first solo artist album entitled 'Flash'; a double 19-tracks mixed CD album on Agnosia Records, which goes in the books as the first Israeli club music artist album in the country. This, however, was only the start of things, as the brother continued to deliver quality productions and it would only be a matter of time before they would be a household name in the international dance music industry. One of the biggest highlights / steppingstones in Flash Brothers' career to date, came at the beginning of 2001. Two of the world's most prolific DJs, namely Paul Oakenfold (Perfecto Records) and John Digweed (Bedrock Records), embraced some of the Flash Brothers' releases and this consequently lead to signing some of these tracks to their respective labels. The Flash Brothers then broke into the UK market under the Flash banner with the release of 'The Days After / Megatron' through Perfecto Records in October 2001. The release was featured on compilations like 'Perfecto presents Paul Oakenfold Ibiza 2001' and the triple mix CD compilation 'Perfecto Collection'. From here on, the Flash Brothers gained international recognition and worldwide fame was the next thing on their agenda. The Flash Brothers are signed today with some of the leading dance labels in the world, such as Oxyd, Direction (Sony/UK), Perfecto, Bedrock, Hooj Choons, Yoshitoshi, Silver Planet, and many more. 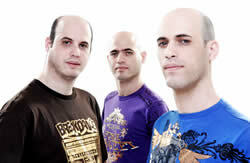 Furthermore, they have been performing as a trio live act with their music for more than six years now. They have played already all over Israel at top clubs such as Haoman 17, TLV, Dome, Octopus, Pacha, Forum, Vertigo, Hata'asiya, Ultrasound, Ku, Vox, and so on. In addition, they've performed at open-air festivals in Israel as well, e.g. Love Parades 1999 to 2003 and Heineken's Sundance Beer Festival. Add to that many successful gigs together around the world in countries like Turkey, Hungary, Sweden, UK, Holland, Poland, Romania, Greece, Cyprus, Ibiza, Croatia, Italy, Ukraine, Czech Republic, Spain, Slovenia and tours throughout Asia. With ever gig, their popularity seems to keep growing among clubbers and fans that support them all the way. The Flash Brothers enjoyed an outstanding 2004, with over 10 single releases on internationally renowned labels, including a remix of 'Who's that Girl' by Eurythmics, and a hot WMC Miami anthem called 'Amen'. The latter was originally released on Oxyd Records, which is a premier Italian house label, and from there on signed to Sony Music's major UK dance label Direction. 'Amen' was considered to be one of the top 20 dance anthems of the 2004 summer season in Ibiza, and got as high as no. 75 in the official UK pop charts. The smash hit can be found on no less than seven CD compilations in the UK, Canada and Italy, including Ministry of Sound's 'Summer 2004' and 'The Annual 2005'. On top of that, early 2004, the boys released a mix CD compilation called 'Flash Brothers present Fear of a Silver Planet 2' on Silver Planet Recordings, making them the first Israeli electronic music artists to release a mix compilation on a UK label. In addition, they also delivered a hot remix of Brad Carter's Ibiza 2004 anthem 'Morning Always Comes Too Soon' on top dance label Positiva Records, which is famed for releases by the Shapeshifters, Paul van Dyk, Deep Dish, Ferry Corsten, and many more. Furthermore, the Flash Brothers performed at many great clubs and high profile events in 2004, including the massive 2004 summer 'MTV Valkana Beach' festival, where they performed live on main stage with Paul van Dyk, Mauro Picotto, Richie Hawtin, and Felix da Housecat, to name but a few. On top of that, they also appeared for an interview on MTV's Dancefloor Chart show, where they played live and were interviewed by Becky Griffin, the host of the show. August 2004 saw the boys playing live at BBC Radio 1's party in Ibiza, and they joined Judge Jules live on the radio together with the fabulous vocalist of 'Amen' to perform the summer anthem 'Amen' live. On top of that, the brothers were also prized as Israel's worldwide export artist of 2004 at the country's dance music awards. In 2004 the brothers were also the only & first ever Israeli djs to enter the DJ Mag top 100 voting list (n. 71), while in the following year of 2005 they were there again voted at 66. That year has also been a very busy, yet exciting time for the Flash Brothers, combining their production work with their increasingly busy tour schedule. For example they played the massive MAYDAY 2005 rave in Budapest - Hungary, 'Renaissance UK club event in Barcelona - Spain, 'Gatecrasher' world tour across Brazil & headlined the 'Final Flash' festival in Slovenia. Also headlined the 6 weeks tour of KENT in all over Ukraine, playing big parties in the biggest cities of the country. Furthermore, they had lots of releases in 2005 including remixes, on leading dance labels such as Whoop, Oven Ready, Harlem (Steve Lawler's label), Nascent, Blu Room, Lowriders, Armada (Armin van Buuren's label), Mondo, Neutone, etc. In 2006 some more big releases came as the vocal hit single 'Faith in love' with Tiff Lacey on top German label Silly Spider Music, that appeared as well on several top German compilations. Other successful releases on Low riders (Holland), Flow Vinyl (Portugal), top remixes on SonyBMG UK, New state UK, Armada music & 2a sides USA, plus the new 'House of Flash' mixed album – that's titled as their very popular net radio show on San Fransisco's Frisky radio (www.friskyradio.com). The guys been voted at no. 23 on the dj mag top 100 voting of 2006. Headlined the official 2006 top 100 party with Paul van Dyk & Armin van buuren at the main room of Fabric superclub in London, and won the award there for the highest climber dj of 2006'. Their productions & Performances in 2007 till now continued to receive wide and frequent support from some of the biggest names in the industry, like Paul Oakenfold, Tiësto, Sasha, John Digweed, Pete Tong, Judge Jules, Danny Tenaglia, Armin van Buuren, Paul van Dyk, Deep Dish, Dave Seaman, Seb Fontaine, Ferry Corsten, Above & Beyond, Markus Schultz, Mark Knight, Steve Angello, Robbie Rivera, Sebastian Ingrosso, Nick Warren, Hernan Cattaneo, James Zabiela, David Guetta, Junior Vasquez and many, many others! Since January 2007 their 2nd radio show started on the leading New York dance radio di.fm (www.di.fm) that hosts other top shows by Armin Van Buuren, Markus Schultz, Ferry Corsten, Carl Cox etc. 'Da Flash' show gained more fans & success, and broadcasted every monthly 2nd wednesday between 12pm-2pm (New York time). Big historic show the guys did on NYE 31/12/08 with FB's headlining the successful open air beach event in Kenya, Africa - as the first ever high profile International DJs to perform in Kenya & push there the Electronic Music. In short, the trio can hardly be labeled as a 'flash in the pan', as they continue to tour their amazing Flash Brothers' show (live act + DJ set) around the world and keep delivering smash productions and hot remixes on top labels, which are featured on countless compilation CDs. The Flash Brothers are here to stay and expect to hear many more great things from them in the future! 3. Adam Foley - "For The Record"
5. Android - "STM 064"
11. ReOrder & JayCan - "Come With Me To Varanasi"